The summer transfer window of this year will be slammed shut this week and despite Jose Mourinho’s call for the market to be closed before the start of every season, he’ll benefit from the current opening. Manchester United youngster Andreas Pereira has been linked with a move to Valencia, reports have now indicated the Brazilian star will join Los Che on a season-long loan move following agreement between both clubs. Pereira was a standout performer for Granada while on loan with them last season but the presence of top-notch midfielders at Man United means he cannot break into the first team of the Red Devils yet. 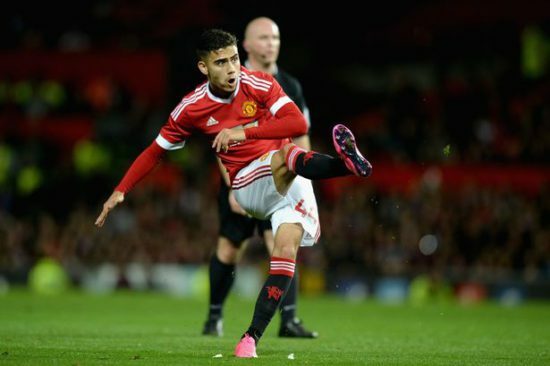 Despite being impressive for Man United on their pre-season tours, Pereira, 21, is yet to feature for Man United this season. The Principal of Valencia was in Manchester over the weekend to secure the deal for the promising Brazilian midfielder and Spanish-based journalist Sid Lowe, has taken to twitter to confirm that Periera is on the cusp of completing a switch to the Metsella Stadium. Retrounited reported over the weekend that Jose Mourinho wants the player to stay put at the Old Trafford but his development would be stalled if he remains on the fringes for the entire part of the season. Ander Herrera has struggled to play ahead of Mata in midfield and knowing Matic and Pogba are indisputable in their position, Pereira has failed to even make the bench. Pereira is no doubt a player for the future but that future is not far-off and if he replicates the form at Granada, he’s likely to stake a claim in the team of Mourinho sooner. A loan move to a Premier league club would have been more beneficial but no English club has come for him. We wish the lad goodluck. ANY MANAGER WHO KEEPS LINGARD AND SEND PEREIRA FOR LOAN IT NEEDS HIS HEAD TO BE EXAMINED. Over my dead body, I ll Neva agree with Jos Morinho .He use players that he loved not what you do.